Bluetooth, iPod/MP3 Input, Back-Up Camera. EPA 40 MPG Hwy/33 MPG City! LX trim, Lunar Silver Metallic exterior and Black interior SEE MORE! KEY FEATURES INCLUDE Back-Up Camera, iPod/MP3 Input, Bluetooth Rear Spoiler, MP3 Player, Keyless Entry, Steering Wheel Controls, Child Safety Locks. Honda LX with Lunar Silver Metallic exterior and Black interior features a 4 Cylinder Engine with 128 HP at 6600 RPM*. EXPERTS REPORT The seats offer just enough adjustability. They are wide, allow plenty of leg movement and are comfortable even on longer trips. -Edmunds.com. Great Gas Mileage: 40 MPG Hwy. WHY BUY FROM US At Honda of San Angelo in San Angelo, TX, we know cars. Better yet, we also know customer service. Want proof? Stop in today and allow us to demonstrate our commitment to excellence. Your perfect car, truck, SUV or minivan is just around the corner. Plus TT&L and fees. See dealer for details. Modern Steel Metallic exterior and Black interior, LX trim. EPA 40 MPG Hwy/33 MPG City! Back-Up Camera, Bluetooth, iPod/MP3 Input AND MORE! KEY FEATURES INCLUDE Back-Up Camera, iPod/MP3 Input, Bluetooth Rear Spoiler, MP3 Player, Keyless Entry, Steering Wheel Controls, Child Safety Locks. Honda LX with Modern Steel Metallic exterior and Black interior features a 4 Cylinder Engine with 128 HP at 6600 RPM*. VEHICLE REVIEWS Edmunds.com's review says The seats offer just enough adjustability. They are wide, allow plenty of leg movement and are comfortable even on longer trips.. Great Gas Mileage: 40 MPG Hwy. WHY BUY FROM US At Honda of San Angelo in San Angelo, TX, we know cars. Better yet, we also know customer service. Want proof? Stop in today and allow us to demonstrate our commitment to excellence. Your perfect car, truck, SUV or minivan is just around the corner. Plus TT&L and fees. See dealer for details. IPod/MP3 Input, Back-Up Camera, Bluetooth. LX trim, Crystal Black Pearl exterior and Black interior. EPA 40 MPG Hwy/33 MPG City! CLICK NOW! KEY FEATURES INCLUDE Back-Up Camera, iPod/MP3 Input, Bluetooth. Rear Spoiler, MP3 Player, Keyless Entry, Steering Wheel Controls, Child Safety Locks. Honda LX with Crystal Black Pearl exterior and Black interior features a 4 Cylinder Engine with 128 HP at 6600 RPM*. EXPERTS REPORT The seats offer just enough adjustability. They are wide, allow plenty of leg movement and are comfortable even on longer trips. -Edmunds.com. Great Gas Mileage: 40 MPG Hwy. BUY FROM AN AWARD WINNING DEALER At Honda of San Angelo in San Angelo, TX, we know cars. Better yet, we also know customer service. Want proof? Stop in today and allow us to demonstrate our commitment to excellence. Your perfect car, truck, SUV or minivan is just around the corner. Plus TT&L and fees. See dealer for details. LX trim, Platinum White Pearl exterior and Black interior. FUEL EFFICIENT 40 MPG Hwy/33 MPG City! iPod/MP3 Input, Back-Up Camera CLICK NOW! KEY FEATURES INCLUDE Back-Up Camera, iPod/MP3 Input, Bluetooth Rear Spoiler, MP3 Player, Keyless Entry, Steering Wheel Controls, Child Safety Locks. Honda LX with Platinum White Pearl exterior and Black interior features a 4 Cylinder Engine with 128 HP at 6600 RPM*. EXPERTS ARE SAYING Edmunds.com explains The seats offer just enough adjustability. They are wide, allow plenty of leg movement and are comfortable even on longer trips.. Great Gas Mileage: 40 MPG Hwy. WHY BUY FROM US At Honda of San Angelo in San Angelo, TX, we know cars. Better yet, we also know customer service. Want proof? Stop in today and allow us to demonstrate our commitment to excellence. Your perfect car, truck, SUV or minivan is just around the corner. Plus TT&L and fees. See dealer for details. EPA 36 MPG Hwy/31 MPG City! Alloy Wheels, iPod/MP3 Input, Back-Up Camera. Milano Red exterior and Black interior, Sport trim AND MORE! KEY FEATURES INCLUDE Back-Up Camera, iPod/MP3 Input, Bluetooth, Aluminum Wheels, Smart Device Integration Rear Spoiler, MP3 Player, Keyless Entry, Steering Wheel Controls, Child Safety Locks. Honda Sport with Milano Red exterior and Black interior features a 4 Cylinder Engine with 128 HP at 6600 RPM*. EXPERTS CONCLUDE The seats offer just enough adjustability. They are wide, allow plenty of leg movement and are comfortable even on longer trips. -Edmunds.com. Great Gas Mileage: 36 MPG Hwy. WHY BUY FROM US At Honda of San Angelo in San Angelo, TX, we know cars. Better yet, we also know customer service. Want proof? Stop in today and allow us to demonstrate our commitment to excellence. Your perfect car, truck, SUV or minivan is just around the corner. Plus TT&L and fees. See dealer for details. Moonroof, Smart Device Integration, Bluetooth. Aegean Blue Metallic exterior and Black interior, EX trim. EPA 36 MPG Hwy/31 MPG City! CLICK ME! KEY FEATURES INCLUDE Sunroof, Back-Up Camera, Satellite Radio, iPod/MP3 Input, Bluetooth, Aluminum Wheels, Keyless Start, Smart Device Integration, Lane Keeping Assist Rear Spoiler, MP3 Player, Keyless Entry, Steering Wheel Controls, Child Safety Locks. Honda EX with Aegean Blue Metallic exterior and Black interior features a 4 Cylinder Engine with 128 HP at 6600 RPM*. VEHICLE REVIEWS Edmunds.com explains The seats offer just enough adjustability. They are wide, allow plenty of leg movement and are comfortable even on longer trips.. Great Gas Mileage: 36 MPG Hwy. 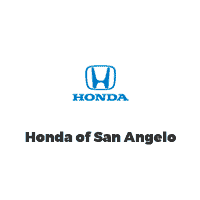 VISIT US TODAY At Honda of San Angelo in San Angelo, TX, we know cars. Better yet, we also know customer service. Want proof? Stop in today and allow us to demonstrate our commitment to excellence. Your perfect car, truck, SUV or minivan is just around the corner. Plus TT&L and fees. See dealer for details. Moonroof, Smart Device Integration, Bluetooth. EX trim, Aegean Blue Metallic exterior and Black interior. EPA 36 MPG Hwy/31 MPG City! AND MORE! KEY FEATURES INCLUDE Sunroof, Back-Up Camera, Satellite Radio, iPod/MP3 Input, Bluetooth, Aluminum Wheels, Keyless Start, Smart Device Integration, Lane Keeping Assist Rear Spoiler, MP3 Player, Keyless Entry, Steering Wheel Controls, Child Safety Locks. Honda EX with Aegean Blue Metallic exterior and Black interior features a 4 Cylinder Engine with 128 HP at 6600 RPM*. EXPERTS ARE SAYING Edmunds.com explains The seats offer just enough adjustability. They are wide, allow plenty of leg movement and are comfortable even on longer trips.. Great Gas Mileage: 36 MPG Hwy. BUY FROM AN AWARD WINNING DEALER At Honda of San Angelo in San Angelo, TX, we know cars. Better yet, we also know customer service. Want proof? Stop in today and allow us to demonstrate our commitment to excellence. Your perfect car, truck, SUV or minivan is just around the corner. Plus TT&L and fees. See dealer for details. Moonroof, Smart Device Integration. Modern Steel Metallic exterior and Black interior, EX trim. FUEL EFFICIENT 36 MPG Hwy/31 MPG City! READ MORE! KEY FEATURES INCLUDE Sunroof, Back-Up Camera, Satellite Radio, iPod/MP3 Input, Bluetooth, Aluminum Wheels, Keyless Start, Smart Device Integration, Lane Keeping Assist. Rear Spoiler, MP3 Player, Keyless Entry, Steering Wheel Controls, Child Safety Locks. Honda EX with Modern Steel Metallic exterior and Black interior features a 4 Cylinder Engine with 128 HP at 6600 RPM*. EXPERTS ARE SAYING Edmunds.com's review says The seats offer just enough adjustability. They are wide, allow plenty of leg movement and are comfortable even on longer trips.. Great Gas Mileage: 36 MPG Hwy. VISIT US TODAY At Honda of San Angelo in San Angelo, TX, we know cars. Better yet, we also know customer service. Want proof? Stop in today and allow us to demonstrate our commitment to excellence. Your perfect car, truck, SUV or minivan is just around the corner. Plus TT&L and fees. See dealer for details.